April 3, 2018 (London, ONT) — Today, LondonOntarioSports.com announces Parkhill, Ontario’s Danielle Austin as the winner of the 3rd Annual Jeffrey Reed Courage Award. Established in October 2015, the Jeffrey Reed Courage Award is an annual award given to a Southwestern Ontario athlete – amateur or professional – who inspires others by demonstrating courage on and off the playing field. In 2001, freelance sportswriter Jeffrey Reed achieved what many thought was impossible. Despite his numerous physical disabilities, and at age 39, he pitched as a rookie for the London Majors of the Intercounty Baseball League. Today, he’s a long-time Wilson Golf Staff Advisor. The Jeffrey Reed Courage Award recognizes athletes who have beaten the odds, and allows them to inspire others. The award encourages athletes to dream big and never strop dreaming; work with mentors and mentor others; learn from failure; give 100 per cent at all times; and never quit. FC London and Fanshawe Falcons soccer player Chelsea Zavitz won the Courage Award in 2016. Her Falcons teammate, Ali Vlasman, who also played for Fanshawe’s women’s basketball team, was the 2017 Courage Award winner. Each year, LondonOntarioSports.com awards the winner with a $1,000 cheque and a plaque. Athletes must nominate themselves with a 1,000-word essay. 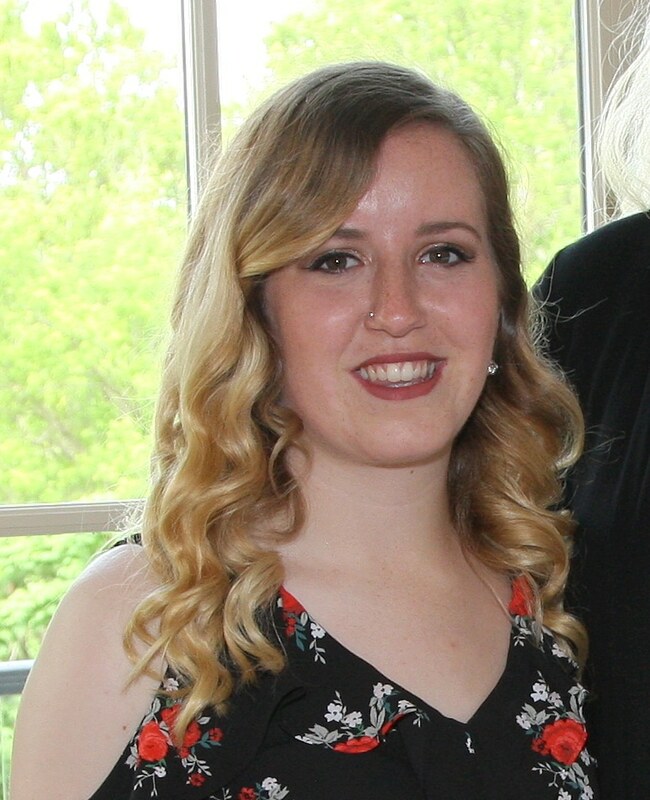 Austin, 22, is completing her third year in the Fanshawe College/Western University Collaborative Nursing Program. In November 2015, this talented athlete was blindsided with a diagnosis of severe Crohn’s disease. She played numerous sports with the North Middlesex District High School Marauders, as well as minor hockey and soccer. In fall 2015, Austin entered her second year of Pre-Health Science studies at Fanshawe College. 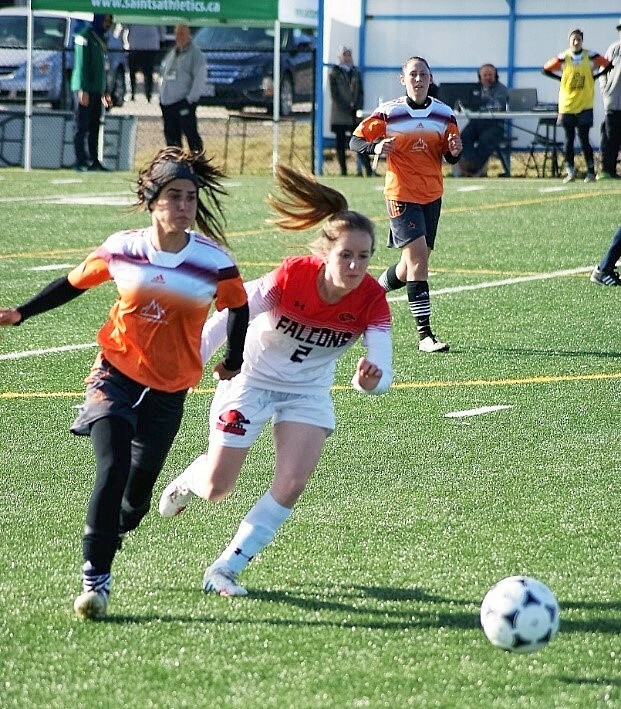 She was a member of the Falcons women’s soccer team, and was named 2014-15 rookie of the year plus an OCAA All-Academic athlete before she was diagnosed with Crohn’s. Austin has decided to stand up to Crohn’s disease with a fundraiser. On June 2, she’ll run 63 km from Grand Bend to London during her journey, Kicking Some Guts One Step At A Time – visit https://crohnsandcolitiscanada.akaraisin.com/other/9dbf657542004026b3d3dc2ad1adea53. Austin’s goal is to raise $2,000 for Crohn’s and Colitis Canada in the fight against and awareness of the two diseases. “When I attended the Jeffrey Reed Courage Award banquet in June 2017, I was inspired by Jeff’s story of courage. It was then that I decided to make the run from Grand Bend to London. Hearing Jeff’s story gave me the courage to do something on my own, and to inspire other people to stand up to Crohn’s and Colitis,” Austin said. Complete biographies and feature stories about all three Jeffrey Reed Courage Award winners are available at the Courage Award link at https://londonontariosports.com. Members of the media are invited to attend Austin’s awards luncheon on Monday, April 30 at Highland Country Club – RSVP by Monday, April 16. Nike Golf’s Lindsey Edmunds will also be honoured April 30 when sister publication LondonOntarioGolf.com presents her with the 8th Annual London Ontario Golf Heart Award. Edmunds was instrumental in establishing the Western Mustangs women’s golf program. Members of the public may purchase advance tickets for the awards banquet for $25 (incl. HST) by contacting news@londonontariosports.com or by calling 519/643-6334. To read a feature story on Danielle Austin, click here. 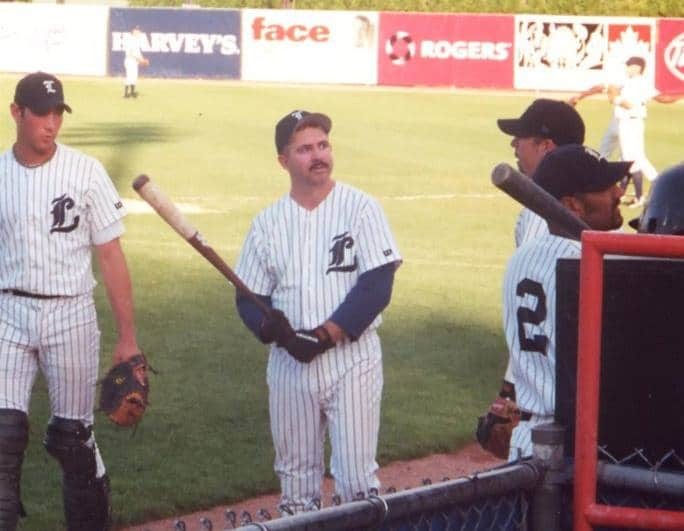 Jeffrey Reed (with bat) and Majors teammates at Labatt Park 2000. The Jeffrey Reed Courage Award (est. 2015) is an annual award given to a Southwestern Ontario athlete – amateur or professional – who inspires others by demonstrating courage on and off the playing field. In 2001, journalist Jeffrey Reed achieved what many thought was impossible. Despite his numerous physical disabilities, and at age 39, he pitched as a rookie for the London Majors of the Intercounty Baseball League. His story, Diamond Dream: Jeffrey Reed’s Inspirational Story of Hope and Determination, recounts his life story, both as an athlete and as an award-winning freelance journalist. Visit http://www.jeffreyreedreporting.com/speaking.htm.